Like Luton, Notts County are finding out the hard way that just being one of the favourites for promotion doesn’t mean you will have it all your own way. Before the campaign began, the Magpies were heavily tipped by most bookmakers for an instant return to League One. It looked like that would be money well spent by punters too after Ricardo Moniz’s side began with a 2-0 win at Stevenage and then dumped Championship side Huddersfield out of the Capital One Cup on their own turf. However, since then, results haven’t gone quite as planned with a home defeat against Mansfield starting a run of three losses in four league games, with heavy defeats at Oxford (3-1) and Morecambe (4-1) leading the boss to declare himself ‘deeply ashamed’ by the United performance. Their cup interest was ended by Aston Villa 5-3, but only after taking their Premier League opponents to extra time, although Moniz found himself in hot water afterwards, receiving an official warning from the Football Association for labelling the match officials as ‘arrogant’. County gained some sort of revenge over Mansfield, defeating them 3-1 in the Johnstone’s Paint Trophy earlier this month, giving County fans a first victory on home soil. The main reason the Magpies were expected to impress this season was after Moniz busied himself massively in the transfer market, signing 19 players in total, easily the most in League Two. The likes of Mawouna Amevor (Go Ahead Eagles), Julian Jenner (Diosgyor), Stanley Aborah (Ferencvaros), Gill Swerts (NAC Breda), Genaro Snijders and Filip Valencic means the County boss has a global squad at his disposal this term. There were a core of English additions too though with Izale McLeod agreeing an undisclosed six figure deal, while Rotherham keeper Scott Loach and Jon Stead, who spearheaded Bradford City’s superb run in the FA Cup last season, scoring at Stamford Bridge, on board as well. A number of Premier League youngsters were enticed to Meadow Lane too, with Kyle Da Silva, Graeme Burke, Adam Campbell and Wesley Atkinson joining in the search for regular first team football. Team news: Luton still have doubts over Paul Benson (neck), Nathan Doyle (hamstring) and Dan Potts (hamstring), but Paddy McCourt is back from international duty, while both Jack Marriott and Cameron McGeehan are free from suspension. 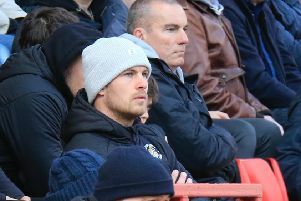 For Notts County, Liam Noble is available once more after completing his three match ban, while defender Gill Swerts faces a race against time to be fit from the knee injury that saw him limp off in the cup game with Mansfield. Top scorers: Hatters - Jack Marriott, Craig Mackail-Smith, Paul Benson, Danny Green Cameron McGeehan (2). Magpies - Graeme Burke, Jon Stead, Genaro Snijders (2). Milestones: Pelly Ruddock Mpanzu will make his 50th appearance for the Hatters if he features on Saturday. The midfielder joined from West Ham permanently in January 2014 and has scored three goals so far. Man in the middle: Ben Toner. Official has had four games so far this season, showing 12 yellow cards in that time. Has been promoted from the Conference where he took 23 matches last term, brandishing 55 yellows and three reds. Officiated Luton once before, as he had the whistle for Hatters’ 2-1 defeat at Welling in the FA Cup during November 2013. The referees assistants are Paul Graham and Robert Whitton with the fourth official Matthew McGrath. In charge: Ricardo Moniz - 51-year-old Dutchman, who spent his playing career abroad with spells at RKC Waalwijk, HFC Haarlem, Helmond Sport and FC Eindhoven. Was then a skills trainer at Tottenham Hotspur, leaving in May 2008 after three seasons, as he took up a position with former Spurs boss Martin Jol at Hamburger SV. Named interim coach of the German side in April 2010, before being appointed Global Director of Youth Development for Red Bull where he was responsible for academies in four continents. However, Moniz then took the decision to move into management, taking over the head coach position of Austrian side FC Red Bull Salzburg in April 2011, winning the league and cup double. Left the club in June 2012 and was named boss of Hungarian outfit Ferencvarosi TC in August 2012, although was sacked in December 2013, and had spells as coach of Lechia Gdansk and then manager at 1860 Munchen. However on April 7, ventured back to English football, signing a three year deal with Notts County, but couldn’t save the club from relegation to League Two. View from the opposition: Ricardo Moniz, talking to the Nottingham Post: “It will be a tough game. I’ve watched them and they can play several systems. “They have played the diamond, they have played 4-2-3-1, so they are adaptable. One to watch: Izale McLeod: 30-year-old signed for an undisclosed six figure fee last month from Crawley Town, penning a two year deal with County becoming the 12th club of his career. Started at Derby, before moving to Sheffield United and then MK Dons, with Charlton shelling out over £1m for his services. Moved on to Colchester, Millwall, Peterborough, Barnet, Portsmouth, MK Dons again, Northampton and then Crawley last season, where be bagged 21 goals. Opened his account this term at the third time of asking, scoring at Mansfield in the JPT, as he has now netted over 150 goals in his career. Friendly faces: Notts County goalkeeping coach Kevin Pilkington joined Luton in November 2009 and played 33 times before moving to Mansfield on loan in October 2010 and then Notts County, where he joined the backroom staff. Centre half Thierry Audel who signed for County in the summer had an unsuccessful trial at Luton in the 2012-13 season. There are three members of the Hatters squad who have loan spells at Meadow Lane during their career too. Nathan Doyle played 12 times for the club in the 2005-06 season, while Ryan Hall made six appearances last campaign, with winger Paddy McCourt also a Notts County player last term, netting one goal in 12 games. Played for both: One of Town’s longest serving players, Bernard Streten, started life at Notts County, before moving to Hatters from Shrewsbury in January 1947, going on to play 299 games, capped once by England, in a 9-2 victory over Ireland. In more recent years, midfielder Andre Boucaud left Luton for Notts County in the 2012-13 season, while former Town striker Danny Crow enjoyed two loan spells at Meadow Lane earlier in his career, before moving to the Hatters. We’ve got form: Hatters have enjoyed a superb record at Meadow Lane over the years, playing 32 times, winning on an impressive 13 occasions, drawing 11 and losing just eight times. Luton haven’t found goals hard to come by either, scoring 49 and conceding 37, keeping nine clean sheets in that time too. They’ve only been beaten once since the 1992-93 campaign, with their last defeat, a 2-1 League Two reverse in March 2003, when Paul Heffernan scored twice late on, with Tony Thorpe’s even later strike a consolation. Hatters enjoyed four consecutive triumphs between 1994-1999 too, making it just two defeats from their previous 15 visits. Town’s best win was a 4-0 success in the old Old Division Two back in 1976, with goals from Alan West, John Aston, Jimmy Husband and Steve Buckley. There have been some high scoring affairs too, a 3-3 draw in 1954, plus a 5-4 defeat during 1952. However it was the scene for one of Town’s bitter disappointments in recent years, as a 2-1 defeat on the final day of the 1991-92 season saw them relegated from the first division. Last time out: Hatters were 2-0 winners on their last visit in League Two on March 10, 2009. Chris Martin put the visitors in front on 25 minutes, before Tom Craddock’s penalty on the stroke of half time sealed the win, beating goalkeeper Kevin Pilkington from the spot. Hatters: Dean Brill, Sol Davis, Ed Asafu-Adjaye, Mark Bower, Asa Hall, Keith Keane, Michael Spillane, Kevin Gallen, Tom Craddock (Jake Howells 86), Ian Henderson, Chris Martin. Subs not used: David Button, George Pilkington, Sam Parkin, Kevin Nicholls.